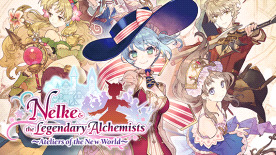 We aim to provide our fans with an entirely new "Atelier" experience, while also inviting back many popular characters of past titles. ©2018 KOEI TECMO GAMES CO., LTD. All rights reserved. GUST is registered trademark of KOEI TECMO GAMES CO., LTD. The KT logo is a registered trademark of KOEI TECMO HOLDINGS CO., LTD.